SkELL (Sketch Engine for Language Learning) is a simple tool for students and teachers of English to easily check whether or how a particular phrase or a word is used by real speakers of English. No registration or payment required. Just type a word and click a button. All examples, collocations and synonyms were identified automatically by ingenious algorithms and state-of-the-art software analysing large multi-billion samples of text. No manual work was involved. SkELL finds good examples of the word or phrase useful for language learners. Google Search finds web pages with information about the topic specified by the word or phrase. Use the Examples button to display examples of the word or phrase in context. Type a word (e.g. controllable) or a phrase (e.g. in regard to) and click the Search button, you will get up to 40 example sentences. Base form will find its derived forms too, e.g. searching for mouse will mice. However, searching for mice (plural, not a base form) will only find examples of mice (not mouse). Finds all parts of speech. If you search for book, it will get sentences with book as a verb as well as a noun and both in various word forms (booking, booked, books). To find examples in other languages, to use more complex criteria or to search for grammar structures rather than concrete words, use the concordance search in Sketch Engine. Collocation is a typical combination of two words. Using correct collocations makes the language correct, natural and advanced. Using incorrect collocations will not usually cause misunderstanding but will be considered incorrect and unnatural. Collocations cannot be guessed, they must be learnt. This is why Word Sketch in SkELL is an invaluable tool. 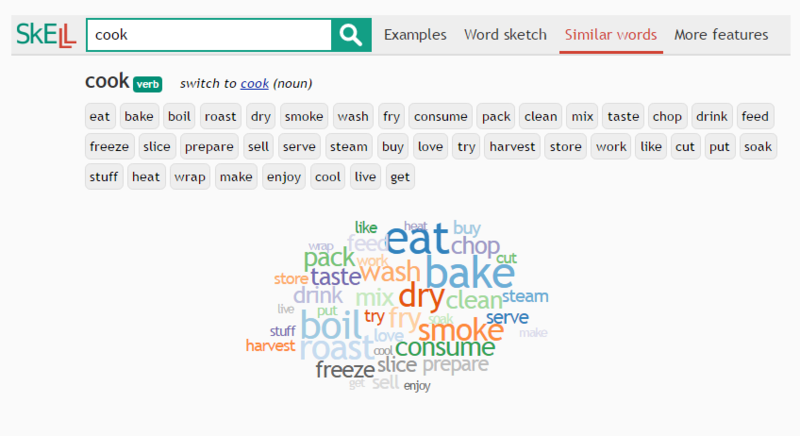 Word Sketch is a summary of the most typical collocations divided into logical categories. Word Sketch in SkELL is available for every content word, i.e. noun, adjective, adverb or verb. 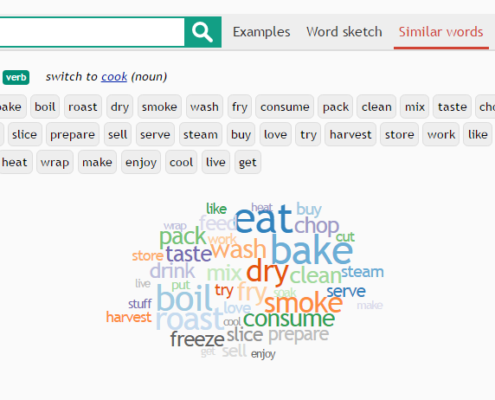 Type a word in its base form and click Word Sketch. Typing mouse will work, typing mice will not. Click a collocation to see examples in context (concordance). By default, the most frequent part of speech (noun, verb, adjective, etc.) is shown first. Click the link to see a Word Sketch for a different part of speech. To generate Word Sketch for words in other languages, subscribe for the Sketch Engine free trial. Click Similar words to display a list of similar words. The list is generated automatically which means is available for every word in the language, provided there are enough examples in the corpus. You will get a list of up to 40 most similar words. The word cloud shows how similar each word is. The words in the centre are the most similar. The size indicates how frequent the word is. Click the link to show similar words for a different part of speech. Click a word to open a Word Sketch. 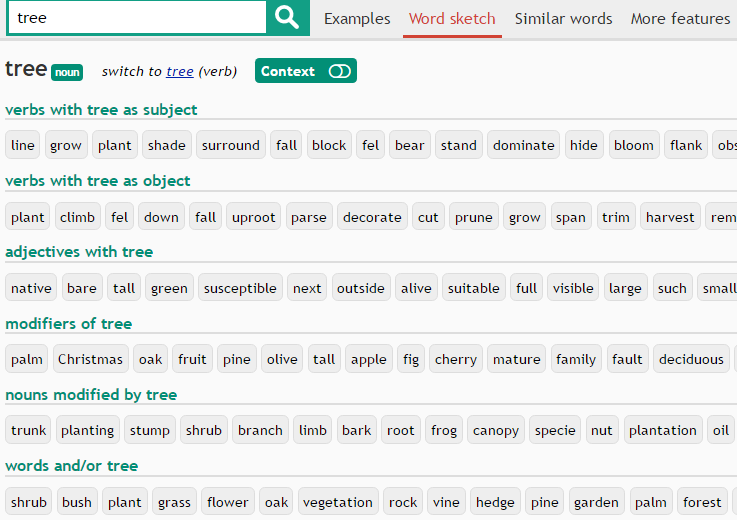 To generate thesaurus for words in other languages, try the free trial of Sketch Engine. Some words do not seem synonyms. Why is that? Sometimes, words which do not seem similar will be included in the results. this is because computers cannot tell the meaning of the word. The automatically generated thesaurus uses a different technology to identify synonyms. It tries to finds words which tend to combine with the same words as the search word. In the screenshot for cook, you can see that try is nearly in the centre, i.e. is very similar to cook. This is because both cook and try combine with similar words: cook fish, try fish, cook pasta, try pasta, cook salmon, try salmon etc. Although inappropriate words might occasionally be included, the list is still very useful and most importantly, it is available for every word in the language. SkELL is a free simplified interface of Sketch Engine adapted to the needs of learners of English. 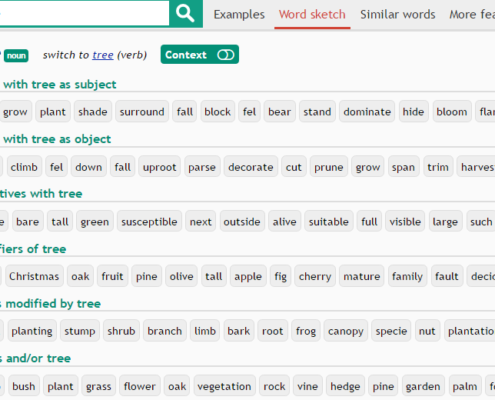 Sketch Engine is a corpus query and management system holding 400+ corpora in 90+ languages. 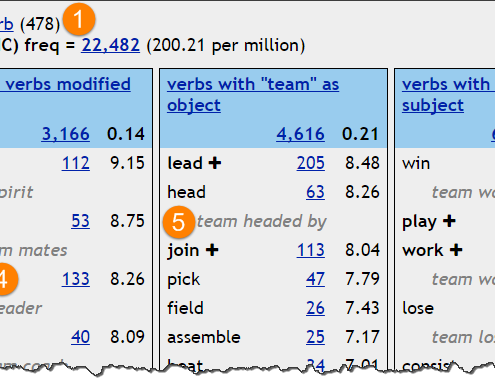 Sketch Engine is used by linguists, lexicographers, lexicologists and other researchers to learn about how language works. Sketch Engine currently handles about 150 TB (terabytes) of data at an unprecedented speed. It is also designed to handle morphologically rich languages such as Russian, Spanish or Japanese. All results in SkELL are a product of ingenious algorithms analysing fully automatically large multi-billion word samples of text, called text corpora. There is no manual work involved when generating the collocations, examples or thesaurus results. See more about the English corpus behind the English SkELL. The text corpora contain a varied collection of texts such as news, academic papers, Wikipedia articles, open-source books, web pages, discussion forums, blogs, etc. to provide a good example of how language is used in everyday, standard, formal and professional context. This service is provided by the copyright holders and contributors “as is” and any express or implied warranties, including, but not limited to, the implied warranties of merchantability and fitness for a particular purpose are disclaimed. In no event shall Lexical Computing Ltd. be liable for any direct, indirect, incidental, special, exemplary, or consequential damages (including, but not limited to, procurement of substitute goods or services; loss of use, data, or profits; or business interruption) however caused and on any theory of liability, whether in contract, strict liability, or tort (including negligence or otherwise) arising in any way out of the use of this software, even if advised of the possibility of such damage. From time to time, the underlying corpus data may change (cleaning, refining etc.). To refer to particular results (using bookmarked URLs for example), also refer to a particular version. The web interface may also change occasionally. Each SkELL page carries a version via link “Terms” in the left corner at the bottom, e.g. VERSION1-VERSION2. This refers to the version of the interface and the version of the corpus data respectively. For reporting issues or writing your feedback, please use the feedback form available on Feedback link at the bottom of each page. BAISA, Vít a Vít SUCHOMEL. 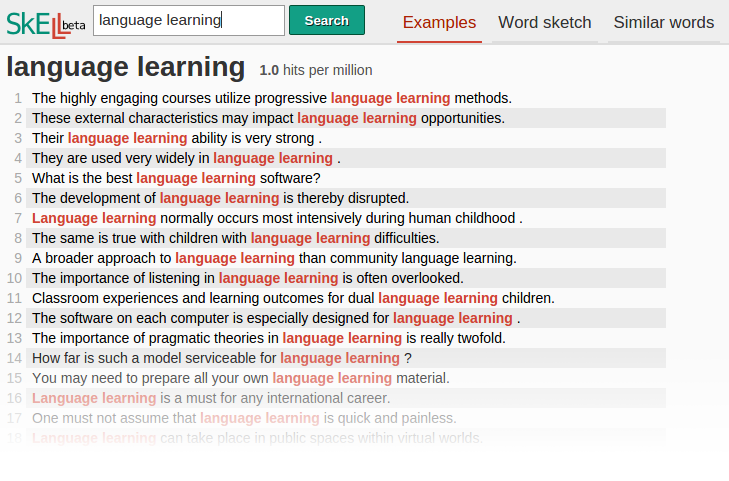 SkELL – Web Interface for English Language Learning. In Eighth Workshop on Recent Advances in Slavonic Natural Language Processing. Brno: Tribun EU, 2014, pp. 63-70. ISSN 2336-4289.